For well over a century, the First United Methodist Church building has established its place in downtown Salt Lake City. The turn-of-the-century structure’s dedication was celebrated across the city and among Salt Lake City’s Methodist community. 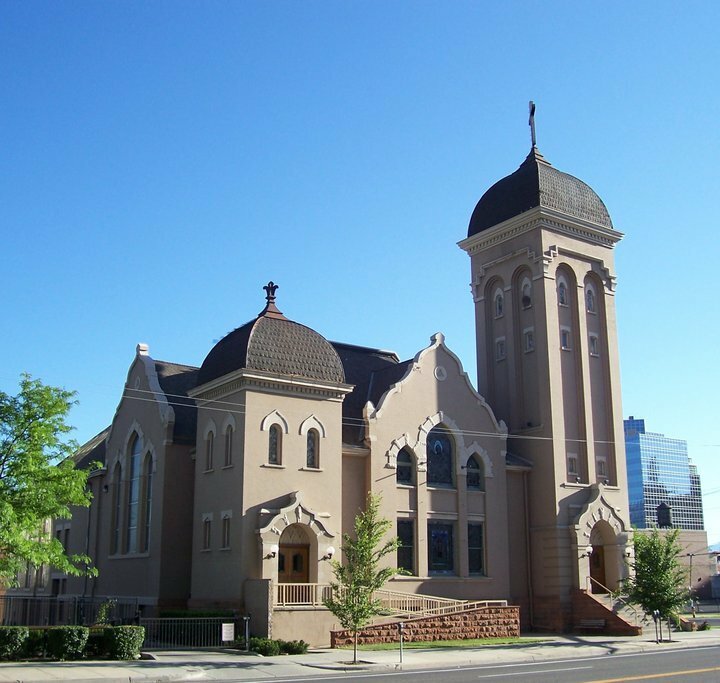 For the last quarter of the nineteenth century (1871-1906), Salt Lake City’s First Methodist Episcopal Church was located downtown on 300 South between Main Street and State Street. This original church structure was dedicated after its completion in 1875. Due to the ever-increasing Methodist population and community needs, the original building was sold in 1905 for the price of $47,500, with the new funds available for the purchase of new property and for the construction of a brand-new building. A new site was purchased on May 10, 1905, for $13,500 at a nearby plot located at 203 South and Second East. The former church building was torn down and the Metropole Hotel eventually came to inhabit the site. Today, the old church and later hotel site is occupied by a parking garage. The task of designing the new church building was placed upon the well-renowned Utah architect, Frederick Albert Hale (1855-1934). 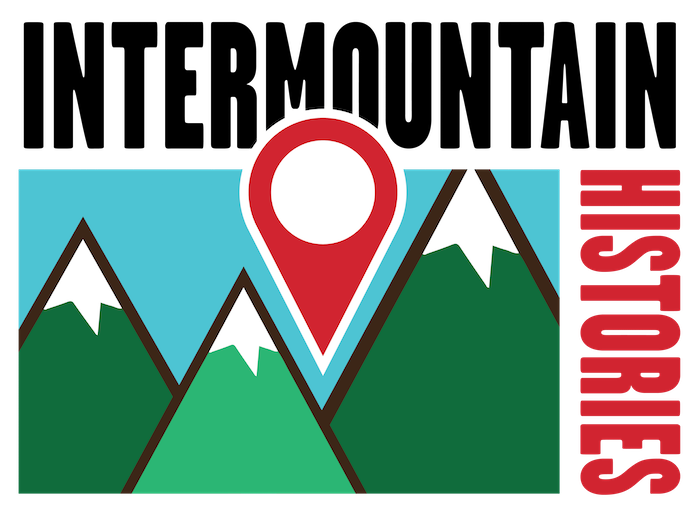 Mr. Hale, originally from Rochester, New York, grew up in Colorado after migrating out West with his parents. He returned to New York, Ithaca in particular, to study at Cornell University to become an architect. After graduating in 1875, Mr. Hale came back to the West where he began his architectural practice with buildings in Colorado, Wyoming, and Utah. In Utah, Frederick Albert Hale’s more well-known works include the Alta Club, a variety of Salt Lake City homes and mansions along South Temple, commercial structures such as the A.O. Whitmore Electric Automobile building and Continental Bank, and civic buildings such as the old Salt Lake Public Library. During his career, Mr. Hale was also the architect for a variety of church buildings in Wyoming and Colorado. However, the only church building Mr. Hale designed and completed in the state of Utah was what would eventually become the First Methodist Episcopal Church building completed in April of 1906 and subsequently dedicated the following month on May 22nd. The dedicatory sermon was given by Bishop Moore of Portland, Oregon who was accompanied by the Utah Mission Superintendent Dr. Henry J. Talbott. Bishop Moore and Superintendent Talbott were also joined by an additional speaker, Dr. Robert McIntyre, pastor of the First Methodist Church of Los Angeles. On the day of the dedication, the church was filled beyond capacity, with occupants overflowing into the classrooms and any available space. The total cost of the structure, property, organ, and interior furnishings was generously donated by loyal and dedicated church members and local citizens; a sum of close to $80,000. The general appearance of what is now the First United Methodist Church has remained essentially the same for well over a century and has played an instrumental role in grounding a strong Methodist Community in the middle of downtown Salt Lake City. Methodists Will Dedicate Church ~ Source: The Salt Lake Tribune. “Methodists Will Dedicate Church,” May 20, 1906. Our Beautiful 1905 Building ~ Source: From the First United Methodist of Salt Lake City, Utah Facebook Page. “Our Beautiful 1905 Building," available at https://www.facebook.com/fumcchurch/photos/a.145019835521997.20898.145015195522461/145025382188109/?type=3&theater. Methodists Prepare to Dedicate New Church ~ Source: The Salt Lake Herald. 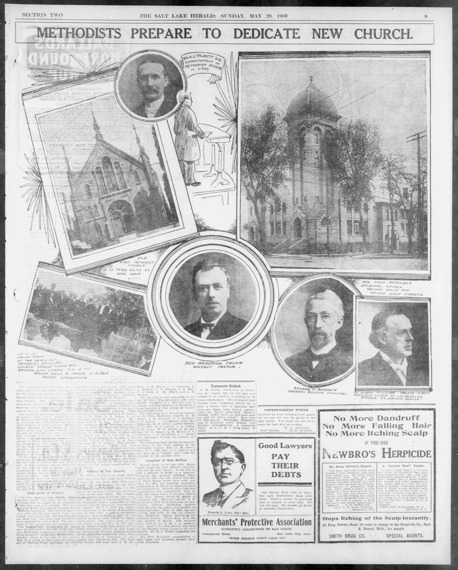 “Methodists Prepare to Dedicate New Church,” May 20, 1906. 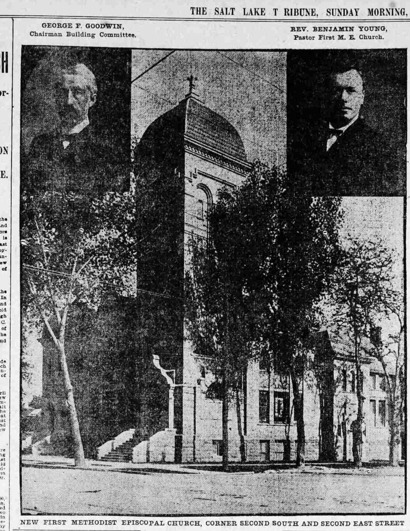 First Methodist Church Dedicated ~ Source: The Salt Lake Tribune. “First Methodist Church Dedicated,” May 28, 1906. Nicholas Shrum, Brigham Young University, “Building Dedication for Salt Lake City’s First United Methodist Church,” Intermountain Histories, accessed April 19, 2019, https://www.intermountainhistories.org/items/show/153. The Salt Lake Herald. 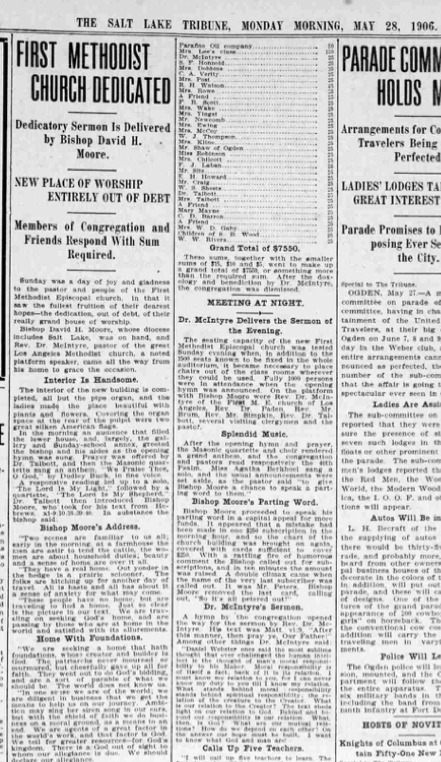 “Methodists Prepare to Dedicate New Church,” May 20, 1906. The Salt Lake Tribune. “First Methodist Church Dedicated,” May 28, 1906. The Salt Lake Tribune. “Methodists Will Dedicate Church,” May 20, 1906.